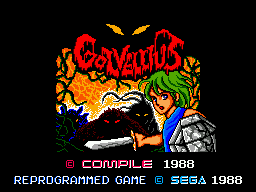 Golvellius, known as Golvellius: Valley of Doom on western packaging and Maou Golvellius (魔王ゴルベリアス) in Japan, is an action RPG developed by Compile for the MSX, and later ported by Sega to the Sega Master System. In Japan, the game not only received a sequel but also a spinoff trilogy with character Randar as protagonist; these have been MSX-exclusive. The game is somewhat similar to Zelda II for the NES, featuring an overworld viewed from above and a series of dungeons or areas which are played as a platform game. While in the platforming areas, the player can only face in one direction and only attack enemies ahead of them. Golvellius has a password system that allows the player to continue with their items intact.